Life hacks bring the promise of making life easier, faster, and cheaper. It’s a great idea that has been widely adopted. Like any movement, some ideas are more promising and useful than others. In this post, I’ll walk you through 20 popular life hacks from around the Internet. You’ll learn which ones are worth your effort and which to ignore. Saving money and stretching your dollar is the objective of many popular life hacks. It’s an admirable impulse in many respects—cutting expenses frees up money for investing and debt repayment. Unfortunately, some money-saving life hacks aren’t worth the effort (unless you have more free time than you know what to do with). Wearing a French-cuffs dress shirt is a great experience. For novices, selecting the right cuff links can be an expensive affair—cuff links available through Brooks Brothers range from $10 to over $500 for packages. What if you lose your cuff links or can’t find them? The life hack community suggests that paper clips can be used as “emergency cuff links”. In my view, the “paper clip as cuff links” life hack has two problems. First, many people will silently wonder at your confused approach to dress: you have the style to wear a good dress shirt and then undermine the effect with improvised cuff links. Second, improvised cuff links undermine one of the chief benefits of putting on formal clothes—to feel like your best. If you cannot find your cuff links at home, it is best to switch to a different shirt. Removing stickers and other unwanted materials from your glasses and other items is a pain. I have certainly gone through the process of trying to remove these by hand. It’s an exercise in frustration! This vodka life hack is simple. Pour vodka over a sticker you want to remove and then hope the alcohol makes it easier to remove the sticker. Unfortunately, this life hack fails for two reasons. First, vodka is much more expensive than actual household cleaning products. Second, items cleaned with alcohol may have an unwelcome smell. Have you ever been assigned the task of watering someone’s plants? If you’re taking care of a friend’s house, this can be a challenging task. After all, they may not have explained where they keep all their plant-care-related equipment. Yes, there is a life hack to address this challenge. Start with an empty water bottle. Next, poke a few holes in the lid. Then fill the bottle with water. Finally, turn the bottle upside down and watch the water pour out. While water will come out, it is very difficult to aim the water. In fact, you may get water all over yourself if you’re not careful. If you find yourself using the life hack more than a few times, then you owe it to yourself to get proper plant-watering equipment. Going out for burgers and fries? From time to time, that’s a fun meal. Especially if you try one of the gourmet burger places that are becoming more common. Once you sit down, you quickly use all the ketchup you could carry in your paper container. To attract tenants, some apartment buildings offer laundry machines directly in the apartment. No doubt, this is a great convenience.Cleaning is a lot easier when you don’t have to carry everything down to a laundry room. According to Forbes, this life hack can add $50-$100 per month to your monthly rent. That’s an expensive amenity. By asking a few questions and shopping around for apartments with a close eye on amenities, you can save several hundred dollars per year. This extra money can make the difference in getting you out of debt faster (or finally putting some cash in your investment accounts). Automating key aspects of your finances is one of the most important lessons of Ramit Sethi’s book and his website, I Will Teach You To Be Rich. For example, your employer may offer retirement benefits but will only do so if you take action to start an account and fill in a few forms. Yes, this is a bureaucratic hassle and may involve a few phone calls and forms. Taking these actions will dramatically improve your financial situation over the years. The best part? Once a month, you can check your accounts and watch the balances increase over time. The quality of our home life is a major contributor to our happiness. The better you maintain your home, the easier daily life is to manage. Consider the following household life hacks. You can learn something from each one, even the debunked ones. Enjoying a cold beverage on a hot summer day is one of the great pleasures of life. In an ideal world, you may keep a few beers (or your beverage of choice) stocked in your refrigerator. If you run out of space in your fridge, you may be want to try the “cold brew on a budget” life hack. 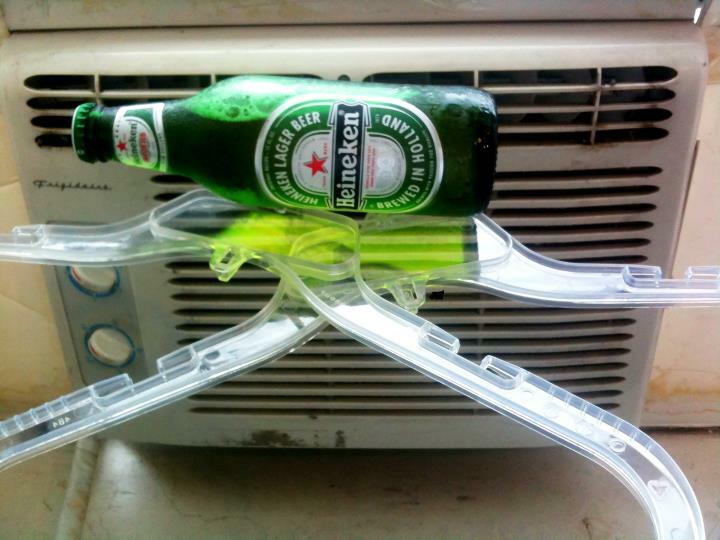 This technique requires holding a beer next to an air conditioning unit, using hangers or tape to keep the beer in place. While this approach may work, it is deeply flawed. Let’s consider this doomed to fail life hack. The likelihood of the beer falling off and smashing on the floor is simply too high for my liking. Instead, putting your beer in the freezer for 15 minutes is a better solution. If you have no freezer or ice available, going out for ice or a drink at a bar is a better option. Over the years, many of us gradually accumulate more electronics. Once you have a computer, a printer, and mobile devices in place, you will start to feel overwhelmed with cables. Even worse, you might lose a critical cable behind your desk—a huge pain if that means you can’t charge your favorite device. Fortunately, there is a low-cost life hack to the rescue—binder clips as cable catchers. By using binder clips, you can easily keep your cables organized. Of course, you may have problems finding paper clips the right size for your desk. A search on Amazon found over 25,000 binder clips for sale available: you ought to be able to find something that meets your needs. Gettign that last bit of toothpaste out is a pain. Before you toss those out, try this simple and successful life hack. Use binder clips to force the remaining toothpaste out of the tube. For the best results, use a new and strong binder clip. Losing your cellphone—especially if it is a smartphone!—is a distressing experience. After a few moments of searching, you may start to mentally calculate how much it will cost to replace and whether you have all your data backed up. Before you throw in the towel and give up, try a website like Where’s My Cell Phone. Simply enter your phone number, click “Make It Ring” and then listen carefully. Tip: If you left your phone set to vibrate mode, you may need to attempt this life hack a few times. For best results, carry your laptop with you and make several calls. It is possible to hear a phone “rings” on vibration mode though it does take more work. Ever since the Pareto Principle became popular, more and more people are looking for ways to make their work life easier. That’s one of the reasons there are so many life hacks designed for cubicle life. Some of these ideas look more like hobbies to pass the time on a quiet Friday afternoon. It all depends on your perspective and your organization’s culture. The Gentle Alarm Clock Life Hack: Put the alarm at least ten feet away so you have to get out of bed when it goes off. The act of getting up on your feet can make the difference. The Harsh Alarm Clock Life Hack: Tape a row of thumb tacks, pins facing up, on to the alarm clock. This scary solution might help – though you might want to keep some bandages near by, just in case. Keeping your coffee supply in good order is important to many in their working lives. Just ask anyone who has spilled coffee on important notes (or even worse – a signed contract!). This life hack suggests that you can use a large clip as a portable coffee cup holder. It can be a great way to save space. Of course, details matter a great deal here. For this life hack to work, you need to find a robust cup holder and carefully choose the right location. Like it or not, most offices are still years away from eliminating paper documents. Until that day arrives, you need systems and tools to keep pens and pencils on hand. In addition to reading “Getting Things Done” by David Allen (you HAVE read it, haven’t you? ), the right office equipment helps. For this life hack, you start with a half dozen circle shaped cork board. Then you drill small pen size holes in the top. At first, you may think that this life hack may not hold that many pens. But how many do you really need on hand? We’re not trying to increase clutter after all. Do you work on a computer all day? Is that computer a laptop? If so, you are probably looking down all day. That means a great deal of strain on your neck. Fortunately, you can solve that problem easily. Look around your desk for an old three ring binder. Voilà! Your laptop is now at eye level and your neck strain problems will rapidly decrease. Post-It Notes have all kinds of uses. You can use them as a simple bookmark (fold the sticky side in). You can also use them to write down reminders (“File that TPS report!”). My favorite life hack for Post-It Notes is to use the sticky side to clean up your keyboard. If your office is filled with Post-It Notes, this could be a good solution. Think before you use this life hack – you don’t want to become known as the eccentric who wastes wasting office supplies in strange ways. There are thousands of technology life hacks available on the Internet. Many of them require experience and knowledge using power tools or the careful dissembly of electronics. What if you lack those specialized skills? I’ve got you covered with these five life hacks. Batteries are a key technology in keeping our mobile lifestyle fully operational. Many LifeHack.org readers likely have several battery powered devices they use every time. It’s frustrating when those electronics run out of power – especially if you’re depending on a battery powered GPS device! What about that old idea of putting batteries in the freezer? Bad idea! Stop doing that! Internet security is serious business. According to a 2014 US News report, hacking and computer crime costs the U.S. economy over $400 billion dollars a year. In addition, many individuals suffer hours of lost time (or worse) in recovering after their accounts are hacked. So, how do you protect uyourself? A full explanation of online security is beyond the scope of this article. However, one life hack you can use is a password manager so you can use employ hard to hack passwords. Do you like commuting to the office? For years, it was a tiresome task. If you drive a car, then reading a book or doing work is out of the question. If you take a train or mass transit, then you might be able to get a seat now and then. These are incomplete solutions to making use of commuting boredom. What you really need are podcasts – Internet audio and video programs on thousands of topics. You can learn about many different topics with podcasts including economics, history, marketing, sales, comedy and more. A MP3 Player: most smartphones can play MP3 sound files. That includes the iPhone and Android phones. You can also use a plain iPod or similar device. Podcasts to listen to: the world’s largest and best directory of podcasts are listed in the iTunes Store, a free program you download to your computer. If you don’t have iTunes or don’t plan to use it, here are a few ideas to get you started. BBC Radio Great Lives: Produced by the BBC, I recently discoverd this series and it is excellent. You’ll learn about many different historical figures. If you enjoy biography and history, this is a great podcast. Entrepreneur on Fire: Do you want to be an entrepreneur? I have a great news for you. Seven days a week, Entrepreneur On Fire has interviews with successful entrepreneurs. You’ll find inspiration and plenty of practical ideas you use in your business. Is your iPhone dead out of battery again? I’ve had this frustrating experience more than once. If often happens when I’m about to read an email or read something interesting. In an ideal world, your iPhone would only lose battery at the end of the day – then you could let recharge while you sleep. What if you need to recharge your iPhone fast? According to the Unofficial Apple Weblog, you can go from 1% to 50% charge in “Airplane Mode” in 45 minutes. Use this simple hack: turn on “Airplane Mode” (i.e. which disables ALL data functions – no email, no Internet, no phone and no messages), plug in your iPhone to a charger and charge from there. Did you know that too much technology can be a bad for your health? Specifically, the light from computer monitors (and other devices) tells your body to stay awake. If you use your computer or TV immediately before going to bed, you will have a hard time sleeping. So, what should you do instead? Do not read non-fiction prior to bed, which encourages projection into the future and preoccupation/planning. Read fiction that engages the imagination and demands present-state attention. What life hack have you tried and had success with?